A few years later, everything changed again. It seemed like overnight, no one had jobs anymore, no one had money anymore, and people started to lose their houses. It was weird, because now that it was obvious that everything had changed, no one wanted to talk about how everything had changed. But when some mysterious social/financial/political force upends the world and changes everything – when “everything is different now” is a description and not a demand – somehow, it gets much harder to agree on whether things were different and what we needed to do about it. It was one thing to demand that the armed guards leave our streets. It was another to figure out how to demand that the silent red overdue bills and sneaky process servers with their eviction notices go away. In this uncertain post-global financial crisis world, Marcus is lucky enough to land a dream job as a webmaster for an independent political candidate who seems committed to real change. But his life becomes much more complicated when a flashdrive with almost a million compromising documents concerning politicians and big businesses is entrusted to him. Is Marcus willing to risk his newfound safety to make these truths come to light? Homeland is a messier book than Little Brother — there are fewer certainties, hazier enemies, and a far less clear victory at the end. But considering that everything is indeed messier now than it was in 2008, this is only appropriate. This lack of clear answers is a deliberate choice that mirrors the current state of the world. And even if there’s no unambiguous triumph for Marcus and his friends, Homeland filled me with hope. It’s the sort of novel that manages to make you feel alive and encouraged and like the world can in fact become better, and I don’t get to feel that way very often these days. Doctorow’s writing is the exact kind of political writing I needed in my life right now. I absolutely loved Little Brother, but Homeland actually hits closer to home. My life changed a lot between 2008 and 2013: there’s now a whole year of unemployment in my life, plus student debt I didn’t know how I was ever going to repay, plus lots of broken dreams about how more education would improve my career prospects. It’s not that I was deceived, exactly, and I’m so incredibly grateful for what my education has done for me in terms of personal development. Still, during this time I had to face the fact that everything I was raised to believe, every strategy my parents’ generation used to make their lives comfortable and safe, is no longer effective or true. Homeland is a novel about kids Marcus’ age coming to the same conclusions, and then deciding to do something about it by trying to change the whole system. Systematic change is less safe, but unlike merely finding a way to do well for yourself despite pervasive inequality, it has the potential to actually be permanent. In her excellent review of the novel, Jeanne asked her readers about the last time they chose safety over freedom, and these are indeed the choices Marcus faces. I really liked the fact that Homeland illustrates that good people often choose safety – people with a political conscience, people who are emphatic and who care, but who are humanly and very understandably terrified of losing the things or people they love. Doctorow doesn’t present us with a simplistic or naïve definition of courage and heroism, but instead shows us how complicated and absolutely terrifying doing what’s right can be. And yet you carry on, because what’s the alternative? Whenever I read Cory Doctorow’s novels, I’m left in awe of how much non-fiction he manages to sneak into his narrative in a seamless and organic way. Homeland will teach you about anything from cold brewing coffee to electronic surveillance to abstract mathematics to the definition of “random”, and all of it is both fun to read and believable within the narrative, because these are the exact kind of thing our narrator, Marcus, is passionate about. Last but not least, I loved Homeland because it’s filled with the same trust in young people to be passionate, smart and politically engaged that made Little Brother and For the Win such a pleasure to read. Condescending to teenagers is still the norm in our culture, and Doctorow’s refusal to do that is part of why I enjoy his novels so much. When you’re young, or otherwise part of a demographic that nobody much sees as being of any consequence, having a single person show faith in you can be extremely empowering. Doctorow’s novels call shenanigans on the idea that the world is irrevocably broken and those coming of age in it can do nothing but bear it, and I love them for that. Being waterboarded was terrible, awful, unimaginable – I still had nightmares – but it happened and then it ended. My parents’ slow slide into bankruptcy, the hard, grinding reality of a city with no jobs for anyone, let alone a semi-qualified college dropout like me, and the student debt that I had to pay every month. It was a pile of misery that I lived under every day, and it showed no sign of going away. It wasn’t dramatic, dynamic trouble, the kind of thing you got war stories out of years after the fact. It was just, you know, reality. Here was a big slice of my city that had turned out to say WRONG. To say STOP. To say ENOUGH. I knew that these were all complicated problems that I couldn’t grasp in their entirety, but I also knew that “It’s complicated” was often an excuse, not an explanation. It was a way of copping out, saying that nothing further could be done, shrug, let’s get back to business as usual. 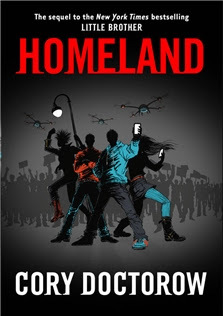 As customary with Doctorow’s work, Homeland was released under a Creative Commons license and is available for free online. All the authors asks is that those who can afford to do so consider donating a copy to a teacher or librarian. Sounds fair enough to me. You gave me about a hundred reasons why I have to read this book, but this is the one that got to me the most-->"It’s the sort of novel that manages to make you feel alive and encouraged and like the world can in fact become better, and I don’t get to feel that way very often these days." Of course, I still need to read Little Brother first. I will admit that I am a safety person but I am drawn to books that endorse the opposite. I like to live vicariously! This book sounds like one of the more relevant ones out there right now...edgy, thought-provoking, grounded. Must read them both. From that inteview you linked to - 'It’s not a coincidence that when tertiary education ceased to be the exclusive province of people who had a lot of political influence, that education ceased to be untouchable as an area for defunding by government.' - pow, mind blown by the suddenly obvious. And I keep reading that 'good president' quote everywhere, it resonates with reviewers it seems even those of us who maybe would have voted Obama if we'd been in the US. I think he's done some amazing work, but at the same time, I really can't get over this article I read where someone visited Guantanamo long after it was supposed to be closed. Everything would be worse under someone else (like a Bush alike! ), but still...not great in some ways, right? I feel similarly whenever our Liberals (who hey, I voted for)talk about the way they're supposed leashing the Tories in and everything would be so much worse without them, but political power restrains their influence...Frankly, I am suspicious of that line and I think it's more that when someone goes into government they're asked to operate in a way different fashion than they would ever propose operating as a regular human being. We're asked to feel sorry for people in government because of that, oh those damn realities, but...if people with supposedly the absolute most power in the country and with some of the highest salaries can't make their country work in a way which doesn't disempower people...I mean we're essentially paying them to keep the country from looting and riots right? I really need to start reading Doctorow. I usually skim through reviews of sequels to books I haven't read yet (I daren't be accidentally spoiled for something I might read in the future), but I forewent that policy since your reviews are always so thoughtful. I am so so so excited to read this book! I really enjoyed Little Brother and have been meaning to get back to Doctorow. I'm so pleased that you found an element of hope in the story - that's easy to lose sight of. I have to read Little Brother soon so that I can get to this! Love what you say about it and about the changes in our world. Thingz have changed so much that our parents, and society, can't possibly prepare us. The tools they can give us just don't work anymore. Our world is still changing and I can't wait to read the fictionalised version where people join together to make change happen. And I just have to say that I love love love Doctorow's attitude to making his work available. love. Debi: Yes, do Little Brother first - but I have a feeling you'll also enjoy this even more. Sandy: Yeees. 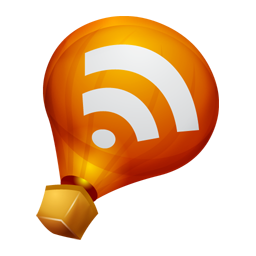 Cory Doctorow is all those things and more. Jodie: "I think it's more that when someone goes into government they're asked to operate in a way different fashion than they would ever propose operating as a regular human being." I think you're probably right. One of the reasons why I loved Borgen is that it shows that tension, but also that it's NOT inevitable. You can resist it and carry on being a person even if you're in a position of great political power, and I'm suspicious of anyone who claims otherwise. Sarah: Yes, it is, but he does a great job of keeping hope in sight while acknowledging how bad things can get. Really looking forward to hearing what you think! Joanna: "The tools they can give us just don't work anymore." Yes, this. And one of my favourite things about the book is that it suggests that instead of developing new tools, we should revise the system altogether. I am not that much into some kinds of thriller. But I didn't want to put it down when I was reading.I love the opening scene.